On This Day: Nov 15, 1979 Rosa Parks was awarded the NAACP Springarn Medal. Rosa Parks was played most notably by Angela Bassett in the 2002 film The Rosa Parks Story. The Rosa Parks Story was written by Paris Qualles and directed by Julie Dash. It was broadcast by CBS on February 24, 2002. Clearly attention was paid to clothing. I really appreciate when filmmakers look at photographs of their subjects and do their best to recreate the photos. Many photos of Rosa Parks are engraved in the minds of many. Having the look of the film match the image engraved in the public's mind is crucial to believably. For lesser known public figures (think the ladies of Hidden Figures) the outfits did not have to be exact replications; only historically accurate. 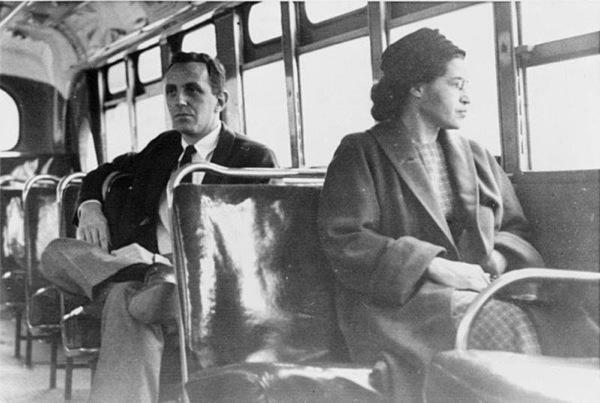 But because Rosa Parks is so well known, the filmmakers had an image to live up to. The film was beautifully done. Have you seen The Rosa Parks Story? What did you think? A really amazing day for his family. I remember mentioning his story in topdissertations writing company review and all of my friends loved it. I guess I'll share this post with them too.